"Hello Dave, I received your name from Mike Strietelmeier. 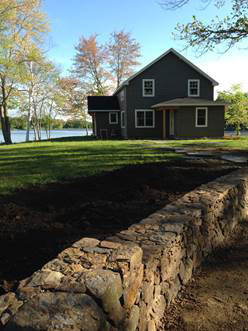 I am in the process of building a Post and Beam home in Woodstock CT. This home has been a long term goal for my wife and I so I am careful to pick contractors to do work in the home. I recently hired Collins to insulate the home. Being Post and Beam, it has a unique structure, primarily the walls were designed by myself as to how they were constructed. I wanted ease of access for mechanicals but wanted the insulation protection of standard SIP panels normally put on these types of home. 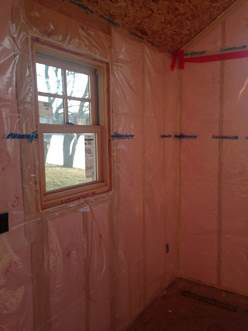 The exterior has Zip board with insulation attached which gives me a R6.6 value to start with along with a vapor barrier and no wood thermal transfer to the outside that the foam provides that is attached to the Zip board. 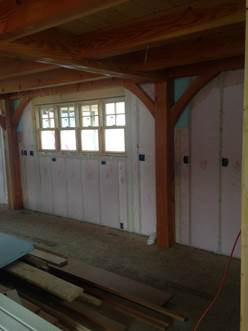 It was now time to determine what to use as a insulation material for the internal 2 X 4 wall. This is where Mike comes in. Mike took the time to listen to my concerns about what to use as well as how to apply the product. There are many hidden compartments with the house between floors. I wasn't too keen on foam about the product's vapors and long term effects. All I would of needed is to have one of my children allergic to something in the home that may cause some short or long term effect to their health. Cellulose seemed ok too but moisture by a lake seemed concerning to me as well. Mike then suggested Fiberglass BIBs, which by the way, NO other company I had quote even offered or mentioned the product. Now comes Vapor Barrier time. There was concern from Mike about apply a plastic film over the wall after being insulated but the Company who designed Roof SIP panels for the Post and beam company insisted an air barrier be put on the wall. Mike took the time to research my issue and came up with a product solution called MemBrain by CertainTeed. The products permeability changes allowing moisture to weep back through the dry wall if any condensation builds up! Smart Plastic-What's next!. I was impressed and so was everyone else I had been talking to. This whole vapor barrier thing seems to be a gray area in the industry. As a topper, Mike then recommends me to Dave Koski, a HERS contractor who sets me up to get a State of CT Energy Rebate to the tune of $5000.00 that I knew nothing about. I'm now in Freaking Heaven! So it now time to work on the home. Adam called me and was very professional and listened to my concerns about getting the right man in charge to run the project. I told him I needed someone who would listen to me and had the patience of dealing with this Post and Beam home. I needed someone to take their time and get it right, especially applying the MemBrain. Well, in walks Sead and Abid. I have never, never, met two individuals who worked so hard as they did. Smart, courteous, understands customer satisfaction, makes good suggestions, clean, talks highly of their company and their staff, the list goes on and on. They treated my home like it was their own. What a SUPERIOR job they did! They are welcome in my home anytime. I will be asking for them personally when it comes time to Insulate my basement in a few months. Dave, I worked in a Customer Service Industry for almost 40 years and understand Customer Satisfaction the way it should be done. You have a good team and a good company. I will be recommending your company to everyone I know." "Collins & Co. is one of the best subcontractors we work with. It is a pleasure doing business with them." "When you are in Collins' hands, you don't have to worry. They are the very best." – Anthony J. Francoline, Avonridge, Inc.